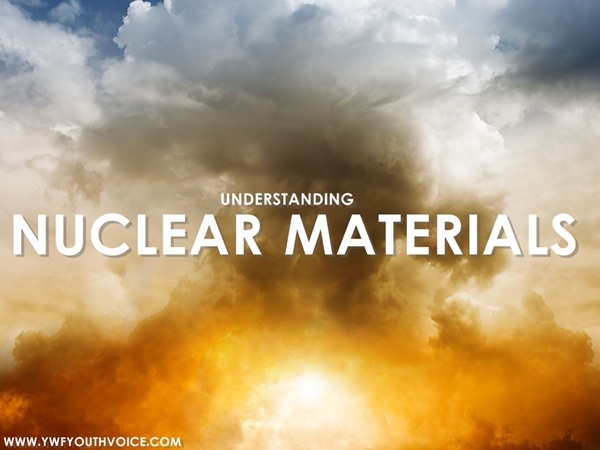 What are Nuclear Materials? Nuclear Fission? Weaponizing Nuclear Materials? "Nuclear materials" most commonly refers to fissile materials that are capable of sustaining a chain reaction in a process that releases energy called nuclear fission. The materials include isotopes of uranium, thorium, and plutonium. These materials are distinct from radio-logical materials like cobalt and cesium, which are used for a variety of civilian purposes, including medical procedures. The nuclear materials which are most commonly used for nuclear energy and nuclear weapons are uranium and plutonium (in various forms). In the NTI Index, "weapons-usable nuclear materials" includes highly enriched uranium, separated plutonium, and the plutonium content in fresh mixed oxide fuel. Nuclear materials are unique because they have the potential to unleash massive amounts of energy through a process called nuclear fission. Fission can occur when the nucleus of a heavy atom, such as uranium or plutonium, is hit with a slow-moving neutron. When this happens, the atom can absorb the neutron, causing the atom to split, producing additional neutrons that lead to more fission reactions and the release of large amounts of energy. Uranium is a silver-colored metal that naturally occurs in rock and seawater. It's about as common as tin or zinc and is found all over the world. Australia has about one-third of the world's natural uranium reserves. Straight out of the ground, only about 0.7 percent of natural uranium is made up of the isotope (or type) uranium-235 (U-235), the key isotope for nuclear power and nuclear weapons. Natural uranium is mostly made up of the isotope uranium-238 and is not weapons-usable. But it can be transformed through a process called "enrichment" to become usable for nuclear energy or nuclear weapons. 1. In milling phase, the rock is crushed and the uranium is separated. 2. It is then oxidized to produce ‘yellow cake’ powder. 3. The final step before enrichment is converting the yellow cake to gaseous form. 4. To do so, the impurities are removed and the uranium is combined with fluorine to make uranium hexafluoride gas, or UF6. There are a number of ways to enrich uranium to a higher concentration of U-235, including gaseous diffusion and laser enrichment. The most common method is centrifuge enrichment. 1. Centrifuges are spun to the point where 3-5% of the output is made up of u-235, at the right concentration to fabricate fuel for a nuclear power plant. This is called low enriched uranium (LEU). 2. Uranium enriched to 90% or higher is said to be weapons-grade, although nuclear weapons can be constructed with lower levels of enrichment. 3. Weapons-usable highly enriched uranium (HEU) is uranium containing 20% or more of the isotope U-235. HEU enriched to this level is used in some research reactors, though advances in technology have made LEU a viable substitute in most research reactors. 4. It is relatively easy to increase the enrichment level from 20% to 90%, one of the international community's key concerns with Iran's nuclear program. Once the desired level of enrichment is reached, the uranium must be fabricated into nuclear fuel or uranium metal for a nuclear bomb. In addition to weapons and research reactors, HEU is also used in the naval sector to fuel submarines. If used in a reactor, the HEU fuel becomes "irradiated," and when removed from the reactor, is highly radioactive spent fuel. 1. The waste is then cooled by water in what are known as spent fuel ponds, or cooled by air in dry casks, which are special storage containers. 2. Once cooled, spent fuel may be transported to a geologic repository for long-term storage in the ground. 3. HEU used in research reactors, in naval programs or in weapons also can be mixed with natural uranium - or "blended down" - to create LEU to be used for power. 4. Since the mid-1990s, about 10 percent of electricity in the United States has come from the down blended uranium of thousands of dismantled weapons from the former Soviet Union. Unlike uranium, plutonium does not occur in nature, except in miniscule quantities. It is a by-product of nuclear reactor operations. To get the plutonium needed to fuel a reactor or build a bomb, spent fuel is chemically treated to separate out the plutonium. This is called "reprocessing." Similar to uranium, there are different types - or isotopes - of plutonium. The key isotope for plutonium in nuclear weapons is plutonium-239 (Pu-239). Plutonium made up of mostly Pu-239 (with less than 7 percent Pu-240, another isotope of plutonium) is considered weapons-grade. Plutonium that can be used in reactors has a higher concentration of the isotope Pu-240. At the end of its lifecycle, irradiated plutonium can be turned into glass through a process called vitrification and treated as waste. Alternatively, it can be combined with uranium to create mixed oxide fuel (MOX), another type of fuel for nuclear power plants. Creating MOX is one way to dispose of excess plutonium. The amount of HEU or plutonium needed for a weapon depends on a number of factors, including the weapon design, the desired explosive power of the bomb, and the concentration of U-235 and Pu-239 to be used. A more skilled weapons designer would only need about 25 kg of HEU - or an amount that would fit in a five-pound bag of sugar - for an implosion-type bomb, which explodes when a sphere of HEU or plutonium is rapidly compressed. It would only take about 8 kg of plutonium, about the size of a grapefruit, to build a bomb. An even less-sophisticated design - a gun-type bomb - would require more HEU (around 50-60 kg), but the assembly would require less expertise. As its name suggests, a gun-type weapon explodes when one piece of uranium is shot at another. The bomb dropped over Hiroshima was a gun-type design and had never been tested before it was used. Today, more than 1,800 metric tons of weapons-usable nuclear materials remain spread across hundreds of sites in 24 countries around the globe — some of it poorly secured and vulnerable to theft or sale on the black market. You can buy premium version of this Presentation, Just Leave Us A Message.